POR MEDIO DE VARIOS COMPAÑEROS DEL ESTADO ESPAÑOL Y TAMBIEN ROSA MALDONADO, OBRERA CERAMISTA QUE RESIDE ACTUALMENTE EN MÁLAGA, NOS HEMOS ENTERADO DE SU ACTUAL SITUACION. DESDE ARGENTINA QUEREMOS PONERNOS A SU DISPOSICIÓN PARA SUMAR A SU LUCHA POR LA RECUPERACIÓN DE SU FUENTE DE TRABAJO. ESTO NO SERA TAREA FÁCIL YA QUE LA DESOCUPACION Y LA PRECARIZACIÓN LABORAL NO SON HECHOS CASUALES Y SON LAS CAUSAS DE POLÍTICAS EMPRESARIALES Y DE ESTADO QUE SIEMPRE PERJUDICAN A LA CLASE TRABAJADORA QUIENES EN REALIDAD SOMOS LOS QUE MOTORIZAMOS EL MUNDO. TAMBIÉN QUEREMOS COMPARTIR UNA REFLEXIÓN Y A LA VEZ UNA SUGERENCIA SOBRE CÓMO LLEVAR SU LUCHA PARA DELANTE. ACÁ EN ZANON SIEMPRE NOS SOSTUVIMOS EN TRES ELEMENTOS MUY IMPORTANTES COMO LOS SON LA SOLIDARIDAD CONCRETA ENTRE COMPAÑEROS DENTRO DE LA FABRICA Y TAMBIEN EL LLAMADO AL RESTO DE LAS ORGANIZACIONES OBRERAS PARA TOMAR SU RECLAMO COMO PROPIO. ESO NOS HACE MAS FUERTE ANTE EL ENEMIGO QUE QUIERE DEBILITARNOS. OTRO PASO ADELANTE ES LA ORGANIZACIÓN Y UN MÉTODO DE TRABAJO QUE SEA CLARO Y REPRESENTATIVO , AHÍ LA ASAMBLEA DE TRABAJADORES ES VITAL PARA LA TOMA DE DESICIONES Y ASI GARANTIZAR LA DEMOCRACIA OBRERA Y DIRECTA. 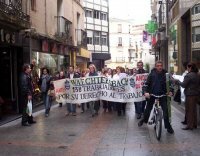 Y POR ULTIMO LA LUCHA, ESA LUCHA CONTÍNUA DEL DIA A DIA RESISTIENDO PERO CON UNA POLITICA A LA OFENSIVA LA CUAL NOS PERMITE LA COORDINACION PERMANENTE CON OTROS SECTORES DE LOS TRABAJADORES. ES MAS FÁCIL ASÍ YA QUE ESTANDO TODOS UNIDOS EN UN MISMO LUGAR NOS HACE MAS FUERTE, A ESTAR TODOS PENSANDO EN SUS CASAS Y DIVIDIDOS. LES MANDAMOS UN FUERTE ABRAZO A LA DISTANCIA Y ESTAMOS EN CONTACTO. SECRETARIO DE ACTAS DEL SINDICATO CERAMISTA Y OBRERO DE ZANON .